The Minnesota Rollergirls will travel to North Carolina to take on the Carolina Rollergirls on Sunday, January 29th. This will be the second time that these two leagues have met. The Minnesota Rollergirls beat the visiting Carolina Rollergirls in a very high scoring bout, 237 - 173. Oh come on, people -- get a grip on the concept of leadership. Look at this war -- from the lies that led us into it, to the lies they continue to dump on us daily. You sit there in Washington so frightened of the big, bad Republican machine you have no idea what people are thinking. I'm telling you right now, Tom DeLay is going to lose in his district. If Democrats in Washington haven't got enough sense to OWN the issue of political reform, I give up on them entirely. Do it all, go long, go for public campaign financing for Congress. I'm serious as a stroke about this -- that is the only reform that will work, and you know it, as well as everyone else who's ever studied this. Do all the goo-goo stuff everybody has made fun of all these years: embrace redistricting reform, electoral reform, House rules changes, the whole package. Put up, or shut up. Own this issue, or let Jack Abramoff politics continue to run your town. Bush, Cheney and Co. will continue to play the patriotic bully card just as long as you let them. I've said it before: War brings out the patriotic bullies. In World War I, they went around kicking dachshunds on the grounds that dachshunds were "German dogs." They did not, however, go around kicking German shepherds. The MINUTE someone impugns your patriotism for opposing this war, turn on them like a snarling dog and explain what loving your country really means. That, or you could just piss on them elegantly, as Rep. John Murtha did. Or eviscerate them with wit (look up Mark Twain on the war in the Philippines). Or point out the latest in the endless "string of bad news." Do not sit there cowering and pretending the only way to win is as Republican-lite. If the Washington-based party can't get up and fight, we'll find someone who can. The General takes a peek at WaPo's new look. Listen to the Armadillo Podcast featuring Melicious of the Texas Rollergirls. Newsday has a feature article in the Long Island Life section on the RockaBetty Bruisers. 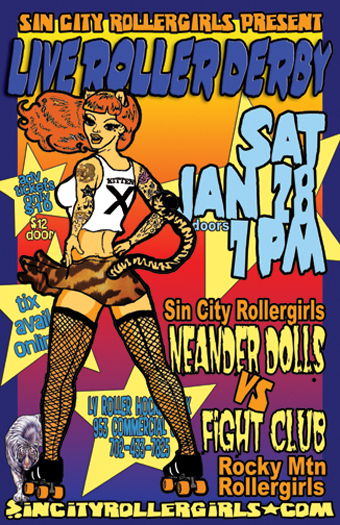 The flat track Sin City Rollergirls will skate against the travel team from the Rocky Mountain Rollergirls in an inter-league bout on Saturday, January 28th in Las Vegas. 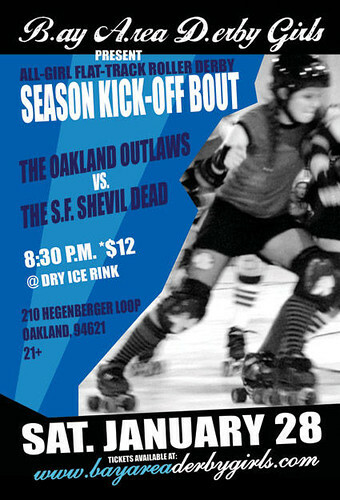 The flat track Bay Area Derby Girls skate their first bout of the season on Saturday, January 28th. The Oakland Outlaws take on the S.F. Shevil Dead. Tickets are $15 for rink-side $10 advance general admission, $12 at the door. Doors open at 8:30pm, bout at 9:30pm. 21 and over. Please visit the B.A.D. Girls website for more info. 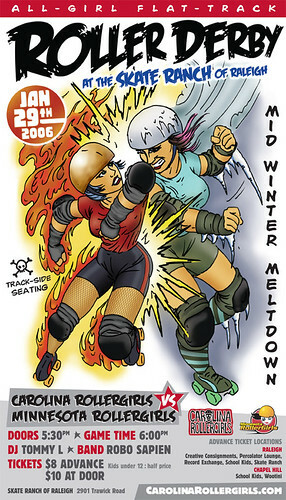 This past Sunday, the Texas Rollergirls celebrated another successful season under their skates at the 2005 Whammy Awards. Full list of award winners here. Lawmakers are about to bombard the American public with proposals that would crack down on lobbyists. Several prominent plans, including one outlined yesterday by House Speaker J. Dennis Hastert (R-Ill.), would specifically ban meals and privately paid travel for lawmakers. According to lobbyists and ethics experts, even if Hastert's proposal is enacted, members of Congress and their staffs could still travel the world on an interest group's expense and eat steak on a lobbyist's account at the priciest restaurants in Washington. The only requirement would be that whenever a lobbyist pays the bill, he or she must also hand the lawmaker a campaign contribution. Then the transaction would be perfectly okay. When homeless individuals around South Florida go to seek shelter tonight- a refuge away from the cold weather sweeping through - they will be able to sleep with a little more ease. 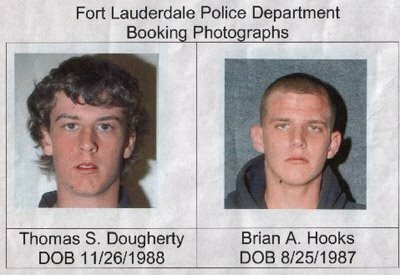 Thomas S. Dougherty, 17-years-old, and 18-year-old Brian A. Hooks, the two suspects captured by a security camera while attacking a homeless man, were turned in today by their families. Captain Michael Gregory released a statement at 3:30 p.m. informing the public that the families of Dougherty and Hooks turned the teenagers over to police around 9:45 this morning. Dougherty and Hooks "They were both quiet, polite and cooperative," Gregory said. He also stated that they invoked their right to silence and the presence of an attorney. Dougherty and Hooks are facing charges of aggravated battery for attacking Jacques Pierre, 58, and the murder of Norris Gaynor, 45. The third victim, 49-year-old Raymond Perez, who was beaten outside Church-by-the-Sea, is also believed to be another of Dougherty and Hooks doing; just one hour after Gaynor was assaulted. The nation watched as Pierre was beaten by the two teenagers around 1 a.m., Thursday, outside of Florida Atlantic University's downtown campus with what looked to be bats. "Everyone saw the footage," Gregory said. This footage, as he notes, was also a critical piece of evidence that aided in the capture of the two males. The authorities received more than 100 tips that led to the arrest of Dougherty and Hooks. Sean Cononie, National Homeless Advocate on Hate Crimes towards the Homeless as well as the founder of the Homeless Voice newspaper is glad the suspects were caught. However, not only does he show empathy towards the victims and the victim's families he also shows empathy for the teenagers and their families. Cononie added, "It's a terrible time for the parents of the suspects as well as the kids." Cononie says. "I am sure these kids were not brought up by their parents to kill people minding their own business and for no apparent reason, as if there could be." Despite the concern for all the members involved, Cononie is convinced we are dealing with a hate crime of epic proportion. "Hate crimes are on the rise for the homeless and other individuals," Cononie says. "It goes back to education and teaching correct values." In fact, because of the increase in hate crimes and terrorism, which Cononie believes are synonymous, three years ago he founded the National Coalition Against Terrorism, Inc and Stopping Hate Crimes USA to investigate why the hate exist and what can be done to dismantle the hate. Although the accusations of the crimes committed have not been directly linked to hate, Scott Russell, a reserve officer in Ft. Lauderdale, sees unlawful death as just that. "MURDER is the Ultimate Hate Crime!" She had to get stiches and spent the day in jail, but other than that, she seems to be ok. 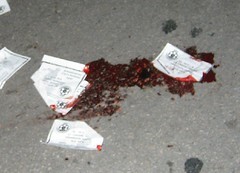 The incident was totally senseless and unnecessary. There were plenty of witnesses. Legal action will most likey be taken. (Rollergirls from across the country are already talking about a legal fund. The Dallas police officer accused of using excessive force while placing a female roller skating on Elm Street under arrest Saturday is not a stranger to such allegations, according to police records. The Dallas Police Department has launched an internal affairs investigation into the scuffle that occurred between Officer Ceaphus Gordon and Michelle Metzinger, a 25-year-old roller derby skater for Assassination City. However, it will not be the department's first look into the 15-year Dallas police veteran's actions. 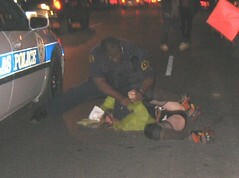 Police records show since 1994 there have been at least six allegations of excessive force, physical abuse or assault. Gordon has been disciplined twice for escalating or participating in a disturbance and once for conduct discrediting the department.